I love Saturdays. Especially ones like today, I woke up early 730ish, and Zach and I took a drive out to a local market to fill up on our Sweet Escape Cupcake Bar supplies. Chris, the owner and baker, did our wedding and has become a good friend. I’ve been working with him to get some professional photos for his location and advertising, and we are devoted customers. This morning he had two new things for us to try out, the strawberry lemon bar, it was still warm out of the over and did not survive the trip to the car, we devoured it sitting on his benches. The second is the cup cake of the month, Root Beer Float! It was wonderful, neither of us could wait until after dinner to dig in. We have officially reached our caloric limit for the day. But don’t they just look so lovely? Once we loaded up our trunk with goodies we headed to a local art installation in downtown York. 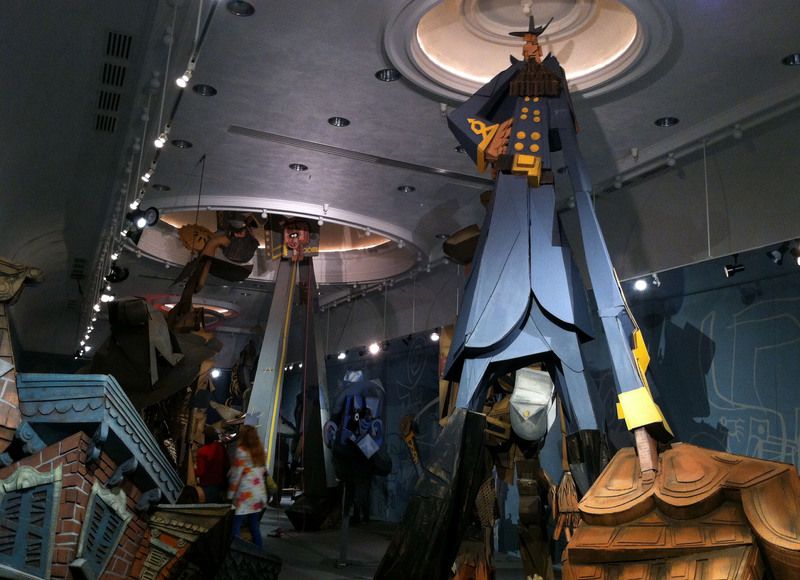 The artist Wayne White has taken over the third floor with some amazing and enormous puppets and pieces, all from cardboard. It tells the story of York during the Civil War and when the Confederates arrived in town. It was awe inspiring, the whole time we walked around I though we needed to bring our Webelos here so they can see the process of creating an installation like this and that this does count as art. The photos don’t really do it justice, Zach is the guy hiding behind the pipe (the yellow vertical things), they are huge. So if you are near the York area you should visit, it is free and interactive, you can move a couple of the puppets. Now for what I have on my needles, you have been very good to wait to see. I was shocked to find that I only have two projects on needles. I know! I promise there isn’t anything wrong and I will get to work finding more things to start on. 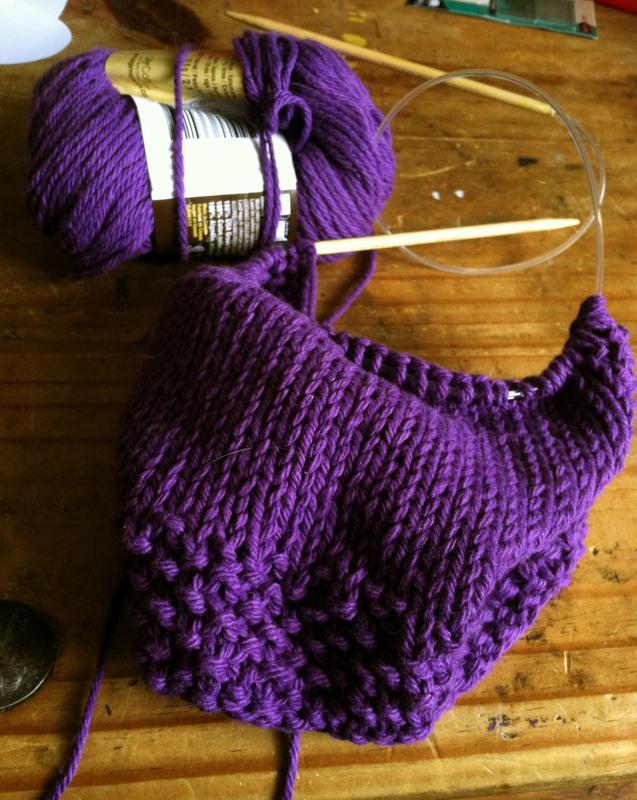 I am finally getting to work on the “Amy Pond” scarf for myself. I decided on the Fern Lace Scarf which is not one of the originals that I had looked at but the pattern is going smoothly. I should have it memorized by the next repeat. It will be getting a post of its own when it is all finished. I also have a washcloth on the sticks and I must say the most annoying sticks I have in my collection. It will not soften up and stop curling up on its own. I have long circulars that are the same brand and some are even longer but this pair is the only one that will not straighten out. I have tried boiling water, it helped a little but eventually curled back up. Any suggestions, other than the obvious, me changing needles. The fern Lace looks lovely. I love doing lace. All my socks seem to have a lace around the cuffs 🙂 Can’t wait to see this when its finished. I share your love for Sweet Escapes. He did the cupcakes for my daughter’s wedding in June 2011. They were delicious. Thomasville is a bit far for a drive for a cupcake. We get our produce there when we go so we can justify it a bit more.